Thanks to Elaine Lipson, we share her thoughts on "slow cloth," a term she began using in 2008. 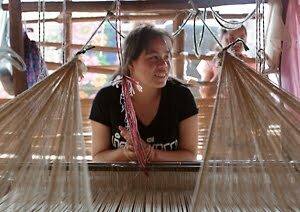 These nicely sum up the qualities expressed in the textiles that are produced by the rural artisans in Thailand and Laos with whom TAMMACHAT works. Visit Elaine's blog on Art, Craft, Culture, Sustainability and Slow Cloth for more of her writings. Learn more about these artisans on this blog and on our website.